What is the proper romanization of the wolf-girl's name? There is a debate between fans as to the romanization of the name of the wolf-girl character in Spice and Wolf. Some claim it should be romanized as Holo, whilst others say Horo. Is there official word on which is correct? According to Yen Press (the English publisher of the Spice and Wolf novels), they were instructed by the Japanese licensor to use "Holo". 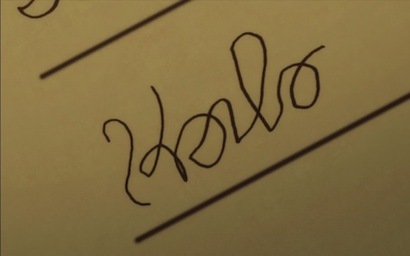 There was also a scene in the anime, season 2 episode 4, showing a hand-written letter that included "Holo". Poor writing, but I think it's obvious that it's an L not an R.
According to one episode in 2nd season and official translation of light novels it is Holo. But Horo has been used for so long, that it is hard to fans to accept the official romanization. Also, in many languages, the official japanese dubbing too sounds more like Horo than Holo. This indeed splits Spice and Wolf fans into two as ホロ is "Horo" in romaji, but in official English translation it's "Holo". For Japanese viewers, the name is "Horo" (ホロ). For English viewers, the name is "Holo". It's also known that HorribleSubs used term "Horo". Not the answer you're looking for? Browse other questions tagged japanese-language spice-and-wolf or ask your own question. Are the honey-pickled apples from Spice and Wolf historically accurate? How did the “silver devaluation” scheme work? What's up with the name “Zerozaki Hitoshiki”? Can someone explain the term “oranyan”? What is the meaning of “Cross” in the title Cross Ange? Why are the translations of 邪王真眼 (jaou shingan) so divergent? Where is the title of Spice and Wolf from? Which is Kraft Lawrence's familiar name, and which his surname? What is the official name for Liore?